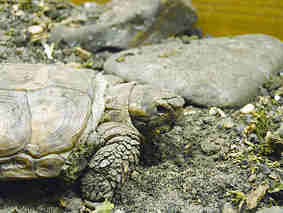 The first time I saw a pancake tortoise was in 1988. I was fascinated by them and began my search for these unusual tortoises. I bought my first male, Henry in 1989. There was then a two-year wait (until 1991) for the arrival of two females, Catherine and Jane. The fourth member of the group, Stanley, joined in 1993. I then split them into two pairs. 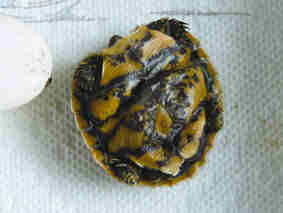 Stanley and Catherine were the first pair to produce eggs and in February 1994 came my first Pancake hatchling, Louis. Henry and Jane failed to produce any eggs and to this day Jane has never laid an egg! Although Catherine went on to lay more eggs, none were fertile. In 1999 Stanley sadly died from unknown causes although only nine years old. The same year Catherine developed a liver problem but made a full recovery. She had an operation, which involved having a "hinged" flap cut through her plastron. All three tortoises were then put in together. Henry's harem grew when they were joined by Louis as soon as she was big enough. Catherine continued to lay more eggs and Louis started to lay. As none hatched I reasoned that Henry was probably infertile. It was therefore, a great surprise when in July 2004 one of Catherine's eggs hatched, ten years after Louis! 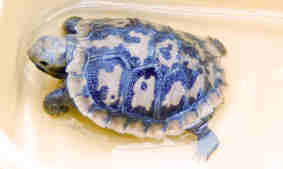 Things continued looking up and in August 2005, Louis produced the first "second-generation" hatchling. Henry had now proved himself! I have learned a lot since my early days of Pancake-keeping. The first fact was that the females do not lay a clutch of eggs, but because of their flattened shape, they lay just one bullet-shaped egg every six weeks or so until 4/6 eggs have been laid. The weight of the eggs is 11-13 grams when laid and the hatchlings weigh in at 7-8 grams. They seem to drink on the day of hatching and eat from one day to a week later depending on the size of the yolk sac. I feed them garden weeds, liberally sprinkled with Nutrobal and calcium, the same as the adults. A daily bath is also much appreciated. The second fact was that when looking for a nest site a female can climb vertically up metal netting to at least 10-12 inches! Both sexes are great climbers. 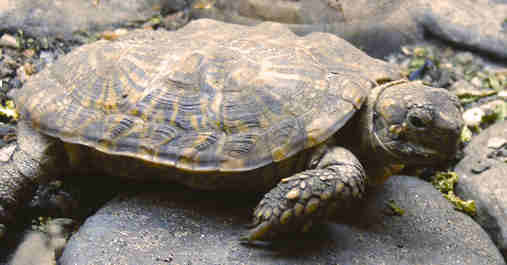 Back in 1989, I could find very little information about Pancake tortoises. I knew that they came from Tanzania and that they didn't hibernate. I was told that they don't drink - this is a fallacy. I had also heard that the hatching time of eggs was unpredictable; this has been proved correct in my experience. The first egg was laid on 24th Oct 93; it had blood vessels on 15th Dec 93 and finally hatched on 19th Feb 94. A total of 12 weeks. The second egg also was 12 weeks from being laid to hatching. The third egg was laid on 19th Jan 05 and I first saw blood vessels in mid-Feb. I expected this egg to hatch around mid-May. My daughter spent an anxious time "egg watching" while I was away, all to no avail. Nothing happened and as time wore on, I assumed something had gone wrong. The egg was left in the incubator - just in case. 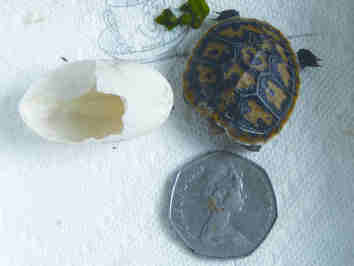 I was amazed when on 03rd Aug 05 a small hole appeared in the shell, which gradually enlarged until I could see a tiny head. This was 28 weeks from being laid to hatching. The moral here is leave eggs alone until they explode or go rotten. I incubate the eggs on vermiculite at 31-32C. My fascination for these animals is unabated and who knows what the future holds. I have learnt a lot from them and no doubt will continue to do so in the years to come.